One annoying problem with Bitcoin is that if you take your eye off of it for a couple days (like I did), it can surprise you. Today the price has dropped to a little under $600, about half of the recent peak from only two weeks ago. In previous posts, we went over the Neptune factor: transiting Neptune is currently conjunct the Bitcoin Venus. This is not enough to kill the upward trajectory... unless a fast-moving transiting planet temporarily strengthens Neptune by any sort of significant aspect. There are examples in previous posts. 1. 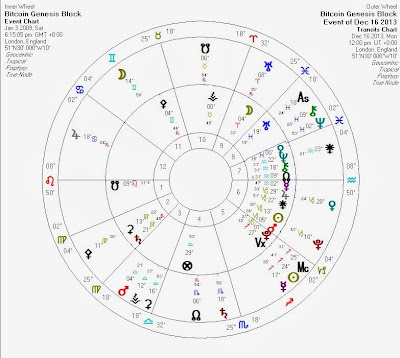 Transiting Jupiter in the 12th quincunx Bitcoin Chiron. Seen before, here. 2. Transiting Chiron quincunx Bitcoin South Node. Seen before, here. Any astrologer who took into account the transits around previous price fluctuations, either by studying an ephemeris or simply by reading this blog carefully could have seen this coming. Jupiter and Chiron are already leaving this configuration, though Jupiter will return. Use your own judgement and act at your own risk, of course... but I'm still bullish. Richard EllisDecember 17, 2013 at 11:16 PM Hi, When you say Jupiter will return, what time frame are you referring to? Cheers ReplyDelete Replies astrolibertarianDecember 18, 2013 at 7:26 AM May 2014, and then every 12 years after that. But even before May, we have Pluto transits to contend with, which will be make-or-break events. More in a future post. Delete Reply AnonymousDecember 19, 2013 at 6:58 AM What do you think will happen when Venus stations and goes Retrograde. It's conjunct bitcoin natal jupiter. I thought as it got close, it would cause a price spike, but it did not. Perhaps when it goes retrograde? ReplyDelete Replies astrolibertarianDecember 19, 2013 at 7:19 AM I was also concerned that the price didn't go up yesterday, but it's much higher this morning than it was last night. So the price spike we've both expecting -might- be underway. Followed, possibly, by a partial correction when Venus goes retrograde.